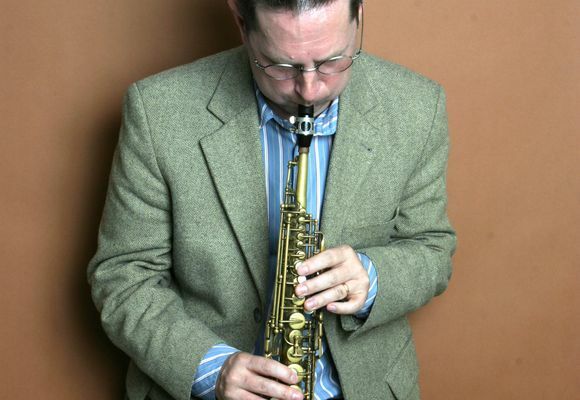 Phillip Johnston is a jazz saxophonist/composer who is best known for his bands The Microscopic Septet, Fast ‘N’ Bulbous, Big Trouble and The Transparent Quartet, and for his scores for film, silent film, theatre and multimedia. The Silent Six is the band that performs with Wordless!, Johnston’s collaborative project with graphic artist Art Spiegelman (Maus). Wordless, an ‘intellectual vaudeville’, is a multimedia show combining a lecture by Spiegelman with a live band which performs original scores by Johnston for 15 slide sequences of graphic art. It premiered in Australia at the Sydney Opera House in 2013, and in the US at the Brooklyn Academy of Music in 2014. Subsequently the show has done a 10-city tour of the US, and performances at the London Jazz Festival, Comicópolis in Buenos Aires and, most recently, at the Paris Philharmonie in 2017. The Silent Six features six musicians who are all bandleaders on their own (except for Hofstra, the consummate sideman). Including veterans of the Microscopic Septet (Hofstra and Hashim), Fast ‘N’ Bulbous (Fiedler), and the Transparent Quartet (Neal Kirkwood), the repertoire for this band draws on the whole history of Johnston’s repertoire, from new (including his new quartet CD) to old and also his interpretations of classic jazz tunes by Jelly Roll Morton and Duke Ellington. In 2018 Johnston has released two new CDs, Diggin’ Bones by Phillip Johnston & the Coolerators and The Adventures of Prince Achmed, a recording of his most recent silent film score. The Microscopic Septet, which he co-founded with Joel Forrester in 1981, has released a 4-CD set on Cuneiform Records of their LPs from the 1980s (Seven Men In Necties/Surrealistic Swing) and 4 CD subsequently, the most recent being I’ve Been Up So Long It Looks Like Down To Me: The Micros Play The Blues, which was launched at Smalls in 2017. Johnston has composed extensively for film including Paul Mazursky’s Faithful, Philip Haas’ The Music of Chance and Money Man, Doris Dörrie’s Paradise and Geld, and Noise by Henry Bean. He has also written for silent film, including Tod Browning’s The Unknown, The George Méliès Project, Teinosuke Kinugasa’s Page Of Madness, F.W. Murnau’s Faust, and Lotte Reiniger’s The Adventures of Prince Achmed. His theatre composition credits include Measure For Measure, War Of The Roses, The Comedy Of Errors, The Merchant Of Venice and Macbeth for Bell Shakespeare; Young Goodman Brown with Richard Foreman, Venus with Suzan-Lori Parks, The Anatomy Lesson of Dr. Ruysch and The Falls with Hilary Bell, and Drawn To Death: A Three Panel Opera with Art Spiegelman. Dance credits include Karole Armitage’s The Predators’ Ball and Keely Garfield’s Minor Repairs Necessary, for which he won a ‘Bessie’ in 1999.